Product prices and availability are accurate as of 2019-04-21 08:56:16 UTC and are subject to change. Any price and availability information displayed on http://www.amazon.com/ at the time of purchase will apply to the purchase of this product. 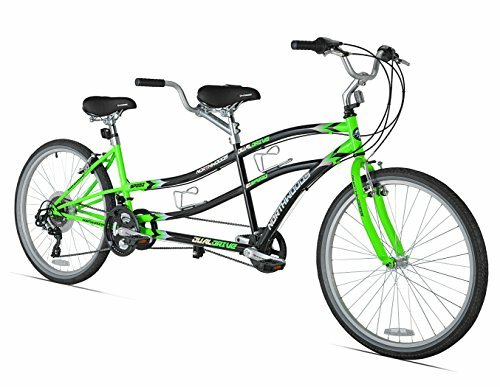 Enjoy a bicycle built for two without breaking the bank with the Kent Dual Drive tandem beach cruiser. The durable, high-quality bike is comfortable and stylish, with a pair of soft gel saddles and extra-wide, bump-gobbling 2.1-inch tires. The components, meanwhile, are built for long-lasting use, including the 21-speed Shimano drive train, Revo twist shifters and reliable alloy linear pull V brakes. Best of all, the frame features low stand-over heights (29 Inch in the front and 20 Inch in back), making it easy for both riders to hop on. Also equipped with a pair of water bottle holders and a heavy-duty kickstand, the tandem bike is perfect for people who want to spend a little quality time with a spouse or good friend.